Abel Tasman exclusive luxury charters, let us arrange a luxury cruise for you and your group. Experience the Nelson region from our luxurious private launch. The Kennedy 19 opulent interior and full catering ensures your day charter with friends, family and loved ones can be tailor-made to suit your individual specifications. Operated by qualified and highly skilled Captain and crew we will take the best care of you and your guests. Whether exploring the Abel Tasman coastline, Nelson waterfront or along the coast toward D’Urville island we will ensure your day is one to remember. Let us help you plan your special day aboard. Cruise The Abel Tasman In Luxury. Our luxury charter offers you a relaxing day in the Abel Tasman. With three crew, including a chef, you'll be sure to have a wonderful day cruising. Let us arrange the perfect exclusive, luxury charter for you. Explore the Kennedy 19 by using your mouse to navigate around the 360° video below. Our luxury charter provides a taste of all the Abel Tasman has to offer from the comfort of our premium launch the Kennedy 19. 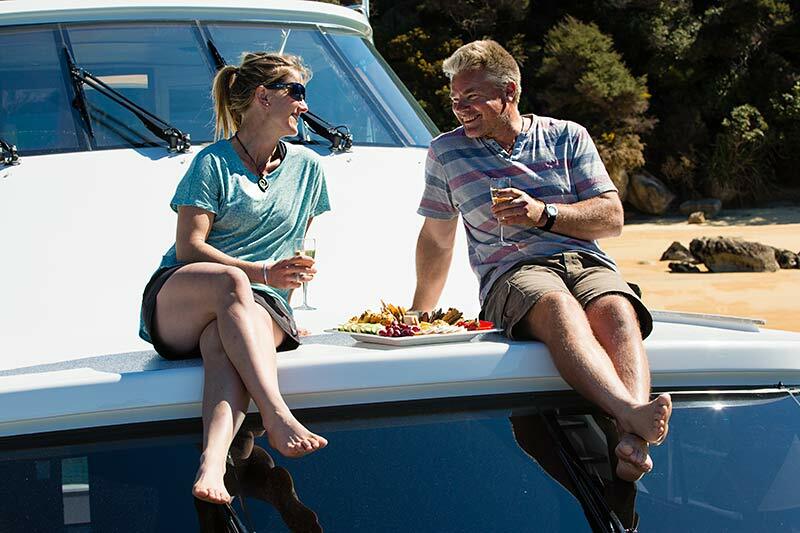 This bespoke charter has the bonus of additional crew and your very own chef to ensure a day of pure comfort while exploring the beautiful beaches and estuaries of the Abel Tasman National Park. Kayaking, hiking and snorkelling in the marine reserve are all options along with a truly guided experience of the local flora and fauna. The perfect cruise for your honeymoon or small group. We off full catering with options for buffet style, fine dining or finger food available. Talk to us about your menu plan or let us organise local delicacies with the boat's private chef. The beautifully-upholstered saloon sofa seat and U-shaped leather-bound galley seating are set around highly polished burr-walnut tables. The outer decks are teak with an expansive boarding platform. The interior boasts two en suite bathrooms and a separate main bathroom. The electronics include satellite TV, a Bluetooth stereo system, underwater LED blue lights and LED lighting throughout. The galley is fully stocked with a built-in fridge/freezer, a separate bar fridge, electric BBQ and convection oven to ensure your chef is able to prepare a delicious menu suited to your taste. With 3 steering stations and 15-inch Furuno touch screens in the navigation suite, the boat is a dream to operate. Add the 3.2 m Aquapro inflatable tender with 20hp, 4 stroke Honda with electric trim and tilt, and there is no corner of the Abel Tasman National Park that we cannot explore. This is a 6 hour excursion that includes 3 crew for your client's comfort. She is a Kennedy 19m or 60ft luxury launch with 3 en-suite cabins and a high-quality interior. She is suitable for small groups from 2 to 6 passengers with larger groups possible also. Talk to us about how we can create a bespoke charter for you. Cost: From $9600 – 2 – 10 passengers for 6 hours. Krause Family They provided great information on the park and NZ in general. Chartered the entire boat for our family - saw seals, Blue Penguin, kayaked, walked Pitt Head and swam. It was fabulous - highly recommend. Wonderful excursion with small group today. We kayaked and hiked in various coves along the north side of the South Island. Captain Rod and son, Angus, made us feel like family. We highly recommend these folks. Exclusive, luxury day charter, just for you.